A special recognition award was presented to John Asher for his commitment to the institute. The Institute of Swimming Pool Engineers (ISPE) paid a special thanks to one of its longest-serving members at the recent annual general meeting, by presenting John Asher with an award in recognition of his commitment to the Institute. 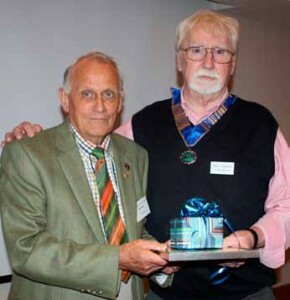 Other awards presented at the AGM in October included two fellowship honours, which were presented to John Cheek of Hydrospec and Graham Kneale of Certikin for their contribution to the industry, and to the Institute in particular. Over thirty students sat the Institute’s Level 1 examinations this year, 17 of whom passed to become newly qualified technicians. Star student Jo Pocock of Tanby Pools in Surrey, picked up a trio of awards including the Gartside Cup for Student of the Year, the Jim Johnson Filtration Shield for the best filtration examination paper and also the new John Asher Cup for the best exam paper in the field of construction. The annual general meeting coincided with the Institute’s 108th one-day seminar that covered aspects of water testing and the design principles of hydraulic systems. The Institute welcomed special guest Martin Easter of Hygena International who gave an introduction to ATP bioluminescence technology – a rapid test system used to measure contamination and microbial risk in commercial pools. Looking at the recent changes to the Control of Explosive Precursors regulations, Howard Gosling warned of the restriction on sales of specific chemicals above certain concentrations to members of the public.